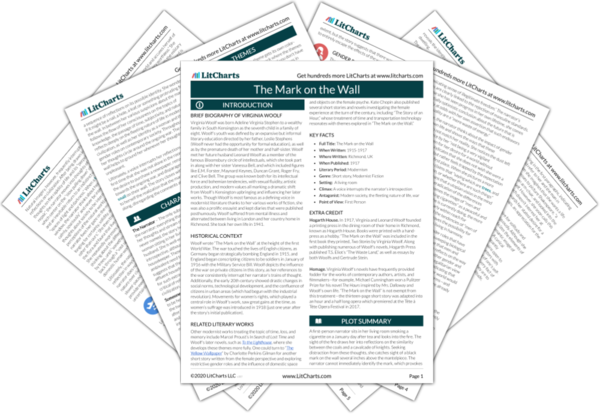 Instant downloads of all 942 LitChart PDFs (including The Mark on the Wall). Welcome to the LitCharts study guide on Virginia Woolf's The Mark on the Wall. Created by the original team behind SparkNotes, LitCharts are the world's best literature guides. A concise biography of Virginia Woolf plus historical and literary context for The Mark on the Wall. A quick-reference summary: The Mark on the Wall on a single page. In-depth summary and analysis of every of The Mark on the Wall. Visual theme-tracking, too. 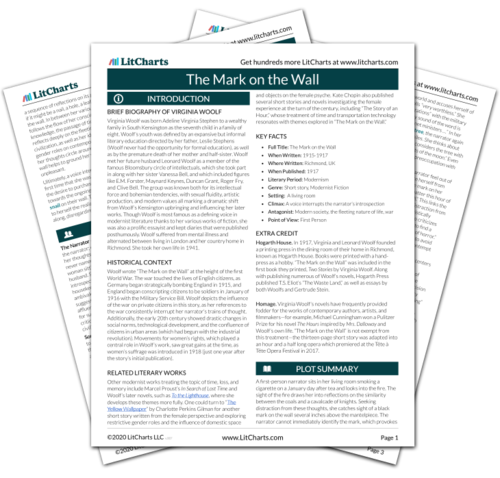 Explanations, analysis, and visualizations of The Mark on the Wall's themes. The Mark on the Wall's important quotes, sortable by theme, character, or . Description, analysis, and timelines for The Mark on the Wall's characters. Explanations of The Mark on the Wall's symbols, and tracking of where they appear. An interactive data visualization of The Mark on the Wall's plot and themes. Virginia Woolf was born Adeline Virginia Stephen to a wealthy family in South Kensington as the seventh child in a family of eight. Woolf’s youth was defined by an expansive but informal literary education directed by her father, Leslie Stephens (Woolf never had the opportunity for formal education), as well as by the premature death of her mother and half-sister. Woolf met her future husband Leonard Woolf as a member of the famous Bloomsbury circle of intellectuals, which she took part in along with her sister Vanessa Bell, and which included figures like E.M. Forster, Maynard Keynes, Duncan Grant, Roger Fry, and Clive Bell. The group was known both for its intellectual force and bohemian tendencies, with sexual fluidity, artistic production, and modern values all marking a dramatic shift from Woolf’s Kensington upbringing and influencing her later works. Though Woolf is most famous as a defining voice in modernist literature thanks to her various works of fiction, she was also a prolific essayist and kept diaries that were published posthumously. Woolf suffered from mental illness and alternated between living in London and her country home in Richmond. She took her own life in 1941. 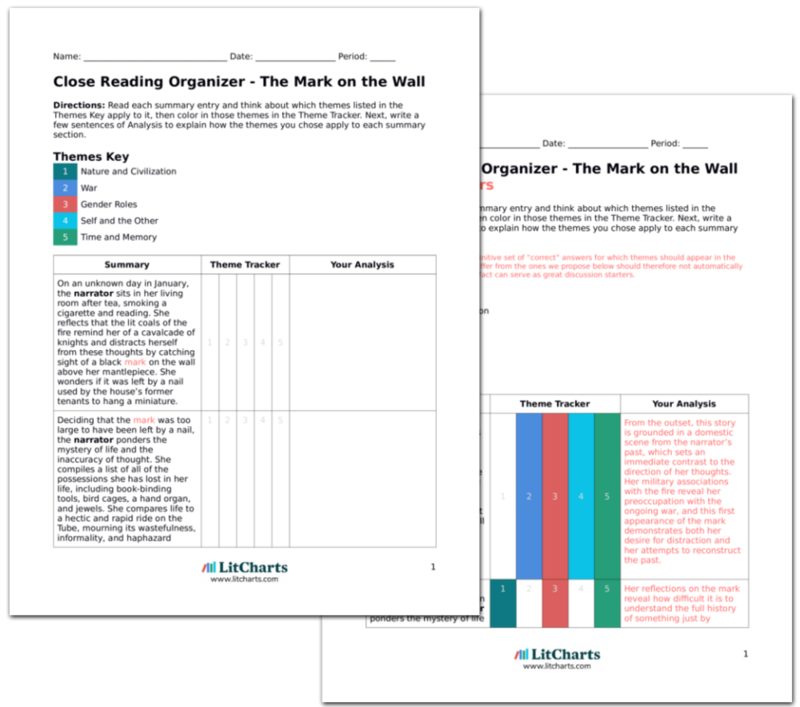 Get the entire The Mark on the Wall LitChart as a printable PDF. Woolf wrote “The Mark on the Wall” at the height of the first World War. The war touched the lives of English citizens, as Germany began strategically bombing England in 1915, and England began conscripting citizens to be soldiers in January of 1916 with the Military Service Bill. Woolf depicts the influence of the war on private citizens in this story, as her references to the war consistently interrupt her narrator’s trains of thought. Additionally, the early 20th century showed drastic changes in social norms, technological development, and the confluence of citizens in urban areas (which had begun with the industrial revolution). Movements for women’s rights, which played a central role in Woolf’s work, saw great gains at the time, as women’s suffrage was introduced in 1918 (just one year after the story’s initial publication). Hogarth House. In 1917, Virginia and Leonard Woolf founded a printing press in the dining room of their home in Richmond, known as Hogarth House. Books were printed with a hand-press as a hobby. “The Mark on the Wall” was included in the first book they printed, Two Stories by Virginia Woolf. Along with publishing numerous of Woolf’s novels, Hogarth Press published T.S. Eliot’s “The Waste Land,” as well as essays by both Woolfs and Gertrude Stein. Homage. Virginia Woolf’s novels have frequently provided fodder for the works of contemporary authors, artists, and filmmakers—for example, Michael Cunningham won a Pulitzer Prize for his novel The Hours inspired by Mrs. Dalloway and Woolf’s own life. “The Mark on the Wall” is not exempt from this treatment—the thirteen-page short story was adapted into an hour and a half long opera which premiered at the Tête à Tête Opera Festival in 2017. Kelso, Emaline. "The Mark on the Wall." LitCharts. LitCharts LLC, 26 Nov 2018. Web. 11 Dec 2018. Kelso, Emaline. "The Mark on the Wall." LitCharts LLC, November 26, 2018. Retrieved December 11, 2018. https://www.litcharts.com/lit/the-mark-on-the-wall.